022 "Fire, Son of Fire"
The full title of this work is "I am the Great One, Son of the Great One; Fire, Son of Fire." The title is from a clause in the Egyptian Book of the Dead and is written in hieroglyphics on the two gray walls on the edge of the green reality in the painting. The three prevailing symbols of God evidenced in this work are the two gray walls, the silhouette of Horus, and the burning bush. The first symbol of God, the gray walls, symbolize God as the frontier between man’s dwelling place in earthly reality and the infinite universe of which man sees very little and understands far less. They are a marker between the green reality of the earth and the maroon of our infinite universe. These walls not only separate the foreground from the background of the work, but also separate the top from the bottom. "As above, so below." The walls are the key to man's understanding of the unknown. The wall on the left says, "I am the Great One, Son of the Great One." The wall on the right says “Fire, Son of Fire”. A second symbol of God is the silhouette of Horus at the bottom right of the work. Horus was the all knowing and powerful God of the Egyptians, represented as a hawk. The hawk is perched on a ball that appears to be embedded in the green reality of earth. Horus and his sphere are both black. Black represents an omniscience of things on earth. The sphere is the earth. Horus is not connected to the universe but only to the earth. The walls, however, touch the symbols of both realities of heaven and earth. Horus touches only the reality of the earth and its potential. Even though Horus is a symbol of god, he is not as great as the God represented by the gray walls. Horus is a god of man. He evolved as a god in the Egyptian myth. Horus is embedded in the earth. He is not suspended like the gray walls and the burning bush. Horus in the Egyptian legend damaged his left eye in a battle to rule Egypt. This damaged eye is represented by the crescent moon. The sun represents his perfect eye. The earth on which Horus is perched is also in the shape of a crescent moon. This would symbolize his partial understanding. Since the sphere on which he is perched represents the earth and that earth is not whole, Horus does not have a perfect understanding of the earth. It is true because he is a fiction created by man. It is therefore understandable that his vision is limited. A third symbol of God is the burning bush in the center of the work. It is a bush but also a tree. It is strong and enduring like a tree but also transient like a bush. The burning bush is a reference to God's revelation of himself to Moses in the Old Testament of the Christian bible. The third symbol of God is the burning bush at the center of the work. It has three sections, the base, the trunk and the top. The base is red and appears to protrude up through the gray clouds. This entire work seems to be a view from above the earth. The green and gray spheres form a cloud that separates the reality above from that below. The red base is like a volcano protruding through the clouds. This base is also one of the six references to fire in the work. The earth's core is made of molten rock or fire that explodes onto the surface. The base of the bush is the fire of the earth. The second part of the bush is the black trunk. 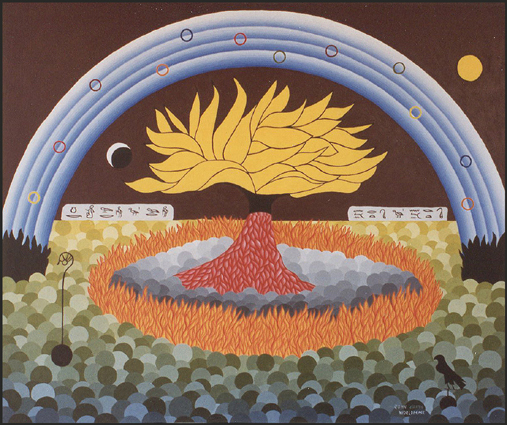 This represents the tree that was once a part of the earth and at the same time the black symbolizes the total infinite potential of the tree or bush. The third part of the burning bush is the top that is consumed in a pure yellow flame. This yellow is the light of God or knowledge of the universe. Together these three parts comprise the third symbol of God in the form of the burning bush. The next most recurring symbol is that of fire. There are six symbols of fire. The first symbol is the gray wall to the right of the burning bush. The inscription is "Fire, Son of Fire". This wall along with the wall on the left form an equation; God equals Fire. Therefore, this work relates one aspect of God and that is his relation to fire. God is more than fire but this work speaks to that part of him. Fire is an aggressive cleanser of all things. Fire converts energy from one form to another. In this process, it takes impure elements and converts them into a new pure element. The green of earth burns and becomes smoke. The smoke returns to the earth to again become green. The rainbow represents this cycle of continuous change. The second symbol of Fire is the volcano that is the base of the burning bush. The volcano represents the earth reality. The core of the earth is fire. The volcano protrudes through the gray clouds or smoke and represents those of the earth reality exploring the higher levels of existence. The third symbol of fire is the top of the burning bush. This is the central part of the heavenly fire or God's light manifesting on earth. It is the primary symbol of God on earth. As fire, God can be understood on the earth. The sun is the fourth symbol of fire. The sun is alone in the maroon universe. The sun is finite in the maroon heaven which is contrary to our view of God. However, this work is only one view of God. It is not a view of God in his infinite totality. The infinite All There Is universe is represented by black, which contains all colors. This Universe is the maroon component of that black universe. The fifth symbol of fire is at the base of the rainbow. It is black and therefore represents the infinite fire of the All There Is. The water of the rainbow both arises from the fire and disappears into it. Fire converts water to steam. The steam condenses and returns to the fire. The black fire reaches up from under the green clouds causing one to wonder what is truly below this cloud plane. The sixth and most obvious symbol of fire is the ring of fire itself. The red base of the burning bush and the yellow top combine to form the orange of the ring of fire. This is a metaphysical fire; part heaven, part earth. The fire is a ring that relates to the infinite nature of God and the never-ending cycle of all things. The fire does not seem to move outward. Instead the earth moves into the fire. The fire is stationary. It is the green earth plane that moves. As the green moves into the fire, it is converted into the smoke which falls back to the earth to become the building blocks of the new growth. The ring of fire is a barrier, which the burning bush has erected. No one comes near the bush without first being cleansed or converted by the fire. The earth reality can never know God. God is of another reality and we must shift to experience an understanding of his universe. The moon represents the partial understanding of All There Is. The black moon represents the infinite all. The white represents the spirit of God in the universe. The white light of the moon represents knowledge and the yellow light represents the spirit of God in the universe. The rainbow is the third dominant symbol of the work. It is blue because a rainbow is made up of water. Humans are 98% water and so in this work of fire and God I have included water to represent man. The rainbow arches above the burning bush. This represents man's desire to be more than God. It is an illusion that God permits. The truth is that the burning bush is God's manifestation of himself to man. Therefore, the bush is only a symbol. God lies in the universe outside the rainbow in a ball of yellow light. Although man thinks he understands God, the truth is that he does not. Man understands what God allows him to understand. The fire or light of the burning bush reflects off the rainbow and creates the rings of red, yellow and blue, green, orange and violet. Through God's light, the infinite beauty of the earth is revealed to man. These colors represent all the perceived colors of this reality. Therefore, God manifests all things for man to see. There are four separate rings of the rainbow. Four is a foundation number and so these four rings represent the foundation of man's existence in this reality. Man's foundation is the earth. He is part of the earth. He is a product of the earth and without it he will cease to exist. The rainbow is also a symbol of a promise; God's promise to man. It is a promise that as long as the earth endues God will to continue to reveal himself and the wonders of the universe to man. It is through his light that we experience and expand into the universe. The last symbol is the staff. Inside the head of the staff is an open hand, symbolizing WorldPeace. The staff is implanted in the black sphere representing earth. This represents the dream of peace on earth in all its dimensions. The staff and sphere are suspended and are not attached to the green earth. Horus who is grounded in the earth looks toward WorldPeace. He considers why there is no peace on earth. The message of this work is that there can be no peace on earth as long as God is viewed in terms of fire. Fire is hellfire. It is war and violence. In the name of God, many have died. As long as God represents fire, there will never be WorldPeace.